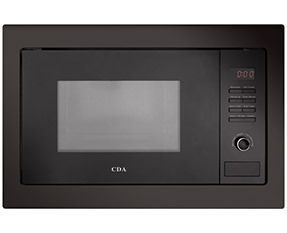 The VM101SS is a freestanding microwave with features that include: auto/manual defrost, an LED timer, 5 power levels, quick start, acoustic end signal and a safety key lock. The VM101SS also has 10 auto cook programmes and easy-tronic control. The VM201SS is a freestanding microwave and grill with features that include: auto/manual defrost, LED timer, quick start, 5 power levels, acoustic end signal and a safety key lock. The VM201SS also has 10 auto cook programmes and easy-tronic control. Adjustable power levels give you flexibility to melt, reheat or cook through and safety key locks prevent settings from being accidentally changed during cooking. We have auto cook programmes that have been designed to cook different meal types, defrost settings to get food from the freezer to the plate as quickly as possible as well as built-in grills and ovens that let your microwave go much further in becoming an indispensable piece of kitchen equipment. Who would be without the defrosting, reheating, steaming, melting capability of a microwave at home? There are so many reasons to have one from prepping tomatoes for peeling, melting sauces for pouring and even sterilising for feeding or preserving. Our microwave ovens range includes models that are designed to be installed in a built-in wall unit and those that are suited to sitting on a work surface or in a pantry in your kitchen. Whichever way you want to lay it out, the microwave has an important and valid role to play in every home. If you prefer the built-in look then a wall unit might work best for you, keeping the surfaces clear and clutter-free. The freestanding models do have the option of being able to be moved around until you find the most convenient and practical location, and you can take them with you if you move. There is also a range of styling options to choose from, including models in full black gloss, black and steel as well as lots of variants in between. You can be assured of their professional levels of performance, testing and reliability so all that is left is for you to pick the one that you like the look of, in your installation style. 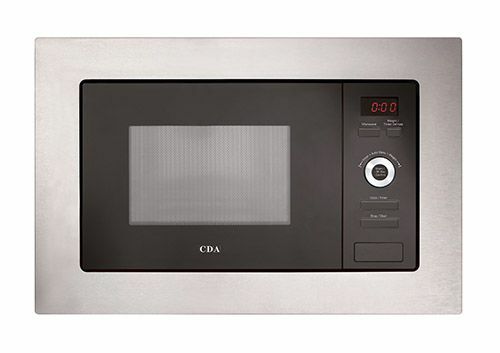 There is also a range of functions across the CDA microwave range with simple, straightforward microwaving models that feature adjustable power levels. Next up are the models that also include a built-in grill to allow you to microwave food and finish dishes off with a browned top. At the most flexible and capable end of the scale, the VM451 includes not only a microwave and grill but also a built-in convection oven that allows you to cook in a variety of styles and lends dexterity to your options in the kitchen. You can also look out for our autocook programmes that take you from ‘frozen mystery lump’ in the freezer to hot and tasty meal. The autocook functions include options for pizza, potatoes, meat dishes, fish, vegetables, hot drinks, pasta, popcorn, chicken and reheating settings to ensure that you are safely cooking meals through.